We need transformational policies and a transformational mindset, to ensure that the forest bioeconomy can help meet the ambitious goals set out in the Paris Agreement. This was the message from the ThinkForest seminar on Climate Policy and Forest Bioeconomy, which was held in Brussels on 4 December. If we want to keep global warming at below 1.5 degrees C we are looking at a transition which is unprecedented in scale. Elmar Kriegler from the Potsdam Institute for Climate Impact Research explained the four pathways to 1.5C in the recent IPCC Special Report. By mid-century, emissions and removals will have to start to balance. There are a range of CO2 removal and mitigation options but it needs a system-wide perspective to look at the synergies and trade-offs. “We are not talking about a single solution, there are choices which have to be made”, agreed Artur Runge-Metzger from the European Commission. We need to drive forward highly productive sustainable land use by 2050, he said. This includes establishing new business opportunities, as well as increasing the capabilities of land and forests to store more carbon in future. Drilling down into some of the possible opportunities, Pekka Leskinen Head of EFI’s Bioeconomy Programme focused on the role wood-based products could play. EFI’s new science-policy study shows that if we use wood-based products, we see lower fossil and process-based emissions, when compared to non-wood products. The substitution impact is a necessary but not sufficient factor to be taken into account in policy making. We need to take a more holistic perspective which considers also for example the role of forests as a carbon sink, harvested wood products carbon storage, and the synergies and trade-offs with the UN sustainable development goals. An interactive panel discussion focused on the policy needs for low-carbon products – what could encourage the change to bio-based alternatives and support their competitiveness. The panel agreed that we need stable and predictable policies to encourage long-term investment and research, and collaboration between sectors. “It’s always hard to be first and drive innovation”, said Linda Rosén, CEO of wood construction firm Lindbäcks Group. Making it easier or more financially attractive is very important, as is assistance with market development and scaling up. The important role of public procurement policies in helping to create a market and increase demand for bio-based products was highlighted by Katharina Knapton-Vierlich from the European Commission. The panel moderator, Lauri Hetemäki from EFI closed the discussion by stressing the importance of a carbon price. A high enough and economy-wide carbon price will be a necessary transformational policy tool for closing the emissions gap, to reach the 1.5 to 2 degrees C targets. A carbon price would also help to boost bioeconomy development. 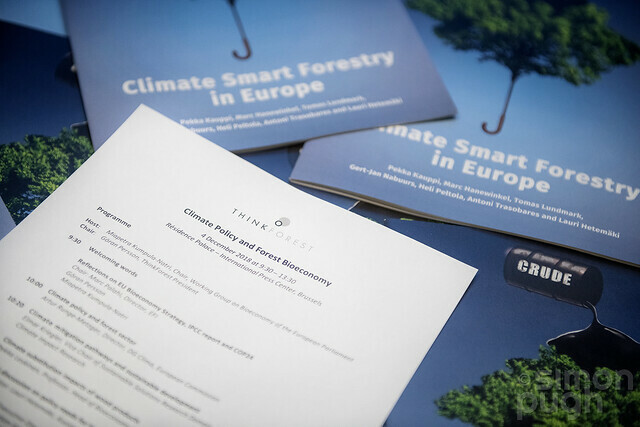 The ThinkForest science-policy seminar, ‘Climate policy and forest bioeconomy’ was held in Brussels on 4 December 2018. Pekka Leskinen, Giuseppe Cardellini, Sara González-García, Elias Hurmekoski, Roger Sathre, Jyri Seppälä, Carolyn Smyth, Tobias Stern and Pieter Johannes Verkerk. 2018. Substitution effects of wood-based products in climate change mitigation. From Science to Policy 7. European Forest Institute.